School is second institutions after family, where the children will be improved leadership qualities and positive social behaviour, apart from the classroom learning. Education aims not only achieving the scoring, but also enhancing the ethics, values, social responsibility and readiness towards leadership to make the citizens of the country. To make it real, the government of Andhra Pradesh planning to provide an opportunity by involving school children in social transformation aims at achieving Swachh Andhra Pradesh. The concept of involving the children in community motivation towards sanitation, not only support the Swachh Andhra Mission, but also helps the children in developing social behavior, positive behavior, self responsibility, understanding the social problems and reacting for resolving the same, improving the leadership skills and human relations. As per the vision of the Hon’ble Chief Minister, Andhra Pradesh to achieve the Swachh Andhra Pradesh by 31st March, 2018, all the school children in the state also will be involving at least two Saturdays in a month and beyond that in motivating the community towards achieving the Sustainable Open Defecation Free status. Therefore, to improve the children to conduct the community motivational activities, it is proposed to organize a series of trainings at district, mandal and school level. Sarva Sikshsha Abhiyan, Department of Education, Government of Andhra Pradesh is in forefront to accelerate various programs and activities to improve both hardware and software components mentioned in Swachh Bharath Swachh Vidhyalaya (SBSV) Guidelines. Apart from the existing programs and policies at the state, SSA, A.P. 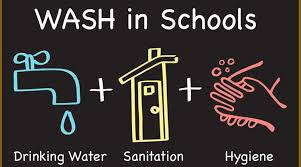 has initiated Water, Sanitation and Hygiene in Schools project with the support of UNICEF to accelerate essential components of SBSV in all the schools in Andhra Pradesh. As part of the project, a one day workshop has been organized on 22nd of June, 2017 for all the POs, DEOs, EEs and other state level stakeholders. In continuation to the same, a 3 day state level workshop has been organized from 12th to 14th September, 2017 at Vijayawada for identified master trainers from all 13 districts. To move forward with the vision of Swachh Vidhyalaya and Swachh Andhra Pradesh a series of training programs are planned at district mandal and school level.